Yes! Another three bean salad! Like we said before - you can never have too many three bean salads. They do make a great side dish for just about any meal. 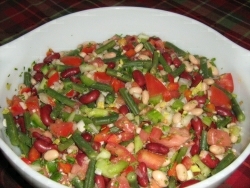 This particular three bean salad can pretty much be a meal by itself. It is just chock full of delicious veggies and beans! It provides almost 10 grams of protein per serving as well as 8 grams of fiber! Serve this salad on the deck this summer with friends and family. Pair it with a fresh loaf of crusty bread and a nice red wine and it is a complete meal! We're sure you will enjoy this recipe. And as always, please let us know what you think. We enjoy hearing from our visitors. Whisk together in a small bowl the oil and vinegar. Combine with veggies in larger bowl. and black pepper and mix well. 28.5g carbohydrate, 4.0g fat, 88mg sodium, 8.3g fiber.